In February 2017, three iPREPWA candidates joined the Research Education and Training Program at the WAHTN, for a six week period working on a RETP project. 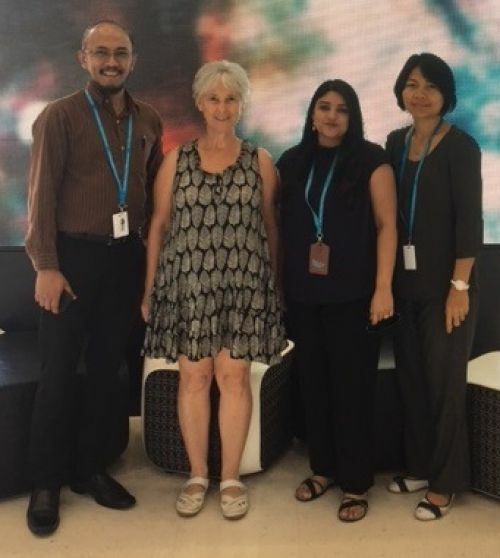 Ms Nurmala Simbolon, Ms Rose Ferrell and Mr Edi Nuryatno are postgraduate candidates who had submitted their PhD theses for examination before joining the iPREPWA team. iPREPWA is an initiative of the five Western Australian universities to encourage research collaboration between industry and the universities. The program involves interdisciplinary teams of PhD candidates who work with an industry partner during their thesis examination period. The three candidates are enjoying working together, combining their different skillsets while researching, evaluating and writing to complete the report on the RETP’s progress to date, and evaluating various components of the courses available through the RETP. The RETP has engaged with the iPREPWA program with three projects since 2015. The benefits and value of the industry to university partnership is seen as highly effective and has greatly enhanced the progress of the RETP since its development. L – R; Edi Nuryatno, Rose Ferrell, Rashmi Watson and Nurmala Simbolon.